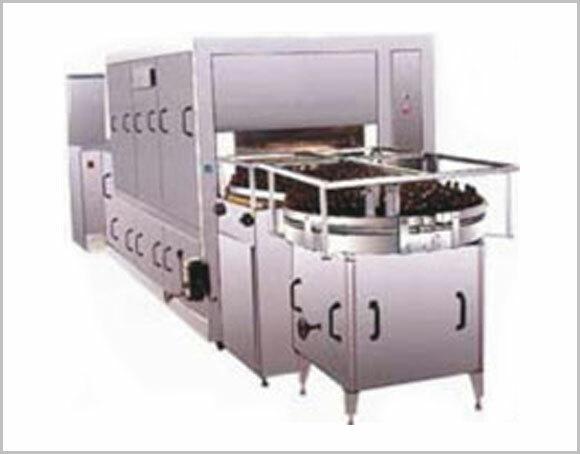 This tunnel washing machine is most ideal for ROUND BOTTLES and finds wide application in PHARMA, FOOD INDUSTRIES. The automatic loading arrangement facilitates loading of bottles on to SS wire mesh conveyer through feed conveyor or bottles are pushed manually from feed table. This saves manpower as bottles are feed into pockets automatically. The automatic unloading mechanism consists of unloading bottle on to a wire mesh conveyor which continues on to turn table. Three cycle rinsing allows flexibilities of various wash cycles such as fresh water, demineralised water etc. as per the rinsing requirement of bottle. All the pumps are made of SS and all the water contact parts are made of SS 304 on a heavy base of MS painted structure. The total rinsing cycle is smooth and limit switches/sensors are built at every stage to sense bottle reversal or bottle obstruction and stop the machine.